GOLDA MEIR. 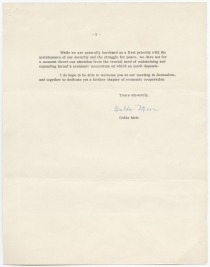 Typed Letter Signed as Prime Minister, to Albert Soffa. 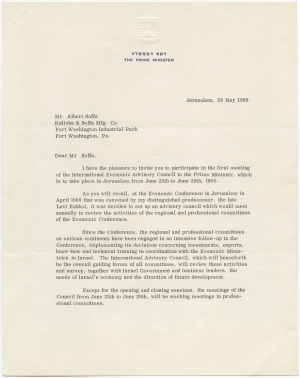 Jerusalem, May 29, 1969. 2 pp. 8½ x 11 in. 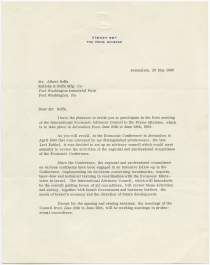 On Israeli Prime Minister letterhead. Albert Soffa (1920-2005) was a mechanical engineer with degrees from Drexel and Harvard. After forming a 1951 partnership with Frederic Kulicke, the pair went on to become leaders in the wire bonding field, a key component of linking integrated circuits or other semiconductors in electronics. He was active on many boards including the Ben Gurion University Board of Governors and a trustee of Drexel University. Golda Meir (1898-1978) was a signer of Israel’s Declaration of Independence. Born in Kiev, she lived in Milwaukee, Wisconsin (1906-1921), then settled in Palestine and took up social work, becoming a leading figure in the Labor Movement. She served as Israeli Ambassador to the Soviet Union (1948-49); Minister of Labor (1949-1956); Foreign Minister (1956-1966) and Prime Minister (1969-1974).